I’m sure you’ve heard the distinction made before between “the cricket” and “a day at the cricket” (John Woodcock said that, whereas he wrote about the first, Alan Gibson wrote about the second). “Good day at the cricket?” is not the same question as “Cricket good today?”. 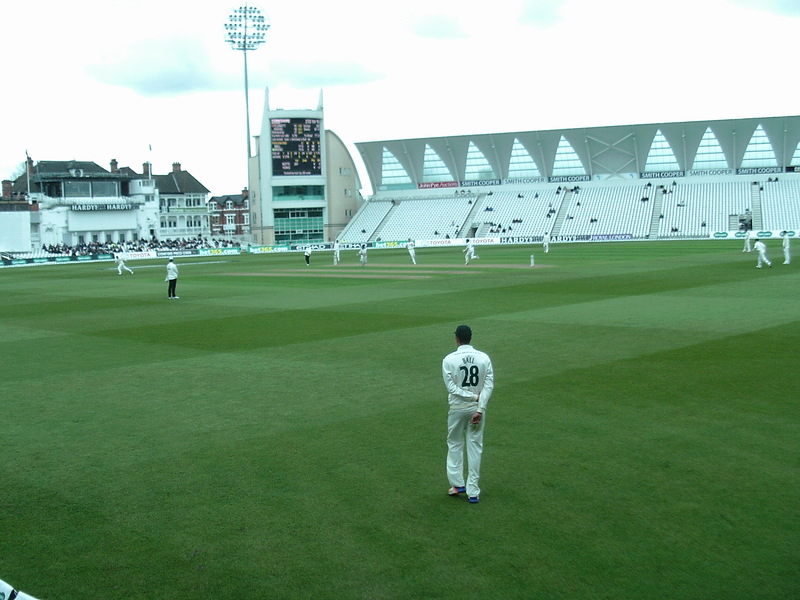 On Tuesday, for instance, when I went to Trent Bridge to watch Notts play Yorkshire, the cricket was good, right enough. 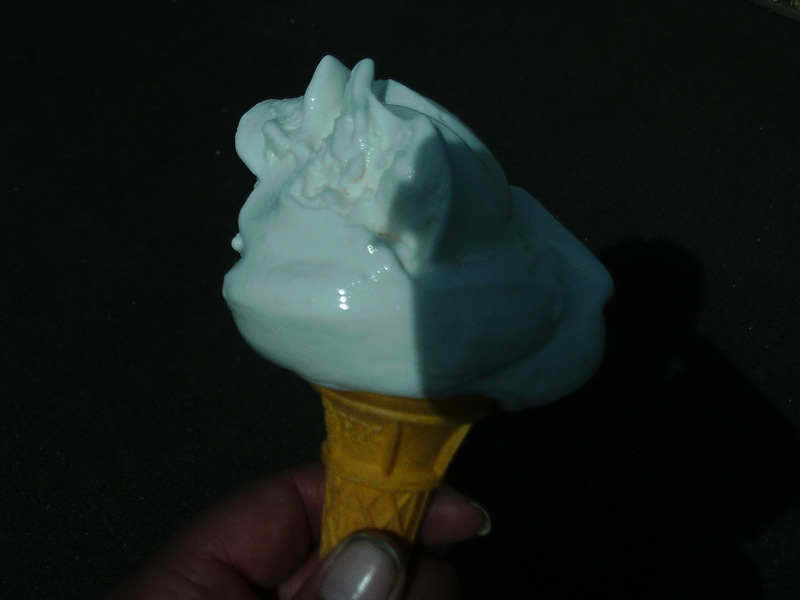 In fact, as George Dobell wrote on Cricinfo, it was “a perfect advert for Championship cricket”. I can’t speak for those who were there on the other three days, but, as a “day at the cricket“, the third day was little short of purgatorial. 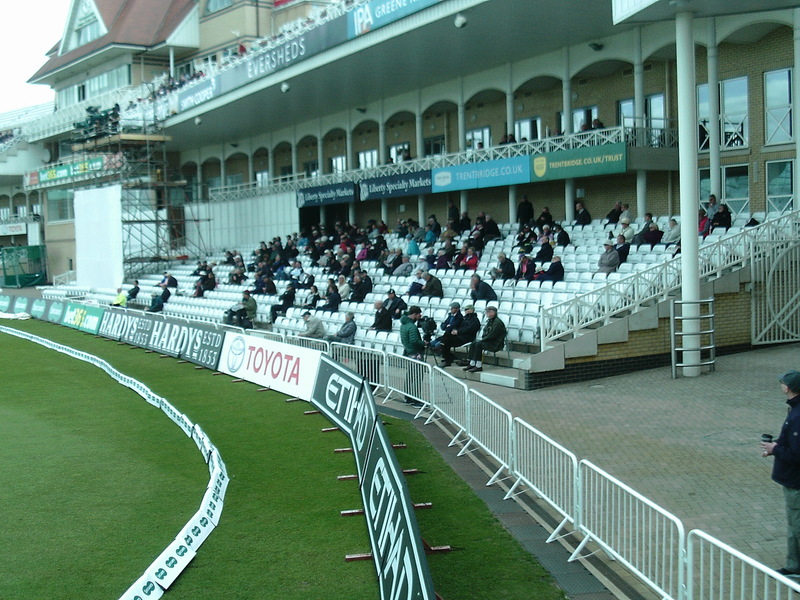 likely to join them), Hales and Broad starring for Notts, Ballance, Root, Bairstow and Plunkett for Yorkshire) ; context (the current Champions taking on one of their most plausible challengers and historic rivals) ; narrative – an even contest where the advantage changed hands by the hour, both sides capable of winning as they went into the last session and the result in doubt to the last ball – yes, all of that. Anyone who was following the game on TV, or online, must have wished they could be at the ground to see it. Anyone who turns to the relevant page of Wisden in years to come will wish they had been there. It must even have looked good from the warmth of the pressbox. 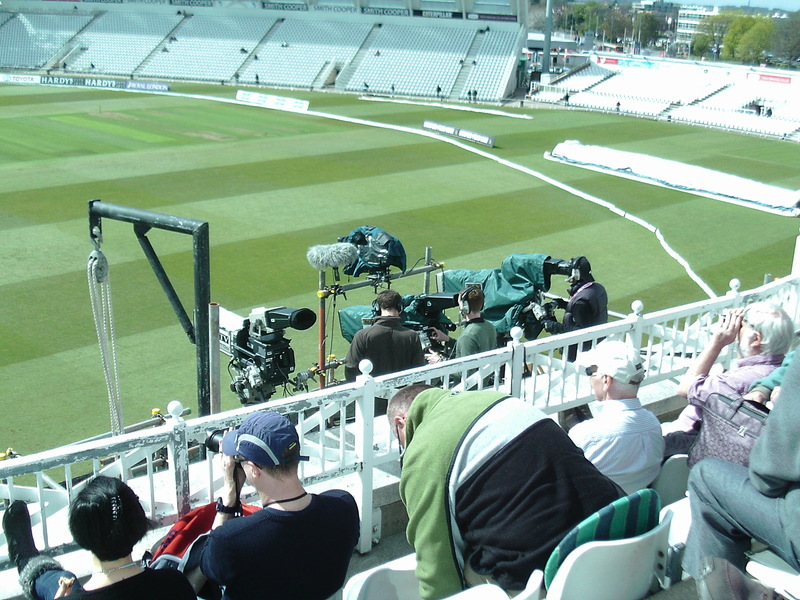 As a game, it made for great reading, and, for those with the ability to concentrate exclusively on what went on between the wickets (the cameraman’s view), great viewing. It even began well ; at the start of play I was in the middle tier of the Radcliffe Road Stand and down to one layer, but by lunch a leaden pall of grey cloud had covered the sun and the cooling breeze had turned into a nasty, insidious little north-westerly wind that seemed to be trying to insinuate itself into any gap in the spectators’ layers of insulation. Not everyone would agree, of course. Most of those who had begun in the Radcliffe Road (Middle or Lower) stuck it out there all day and were probably rooted to the same spot for all four days. The first 20 overs yielded 32 runs, which must have puzzled anyone whose previous experience of cricket was of the 20 over variety. It was an afternoon for the purist, a day for the connoisseur, and, if it had only been a little warmer, it would have been a day for me. As it was, I took what turned out to be a brief abandonment for bad light and drizzle as a sign that I should make my excuses (“sorry – I’m not from Yorkshire“) and scuttle off back to the warmth of the Railway Station and Leicestershire. 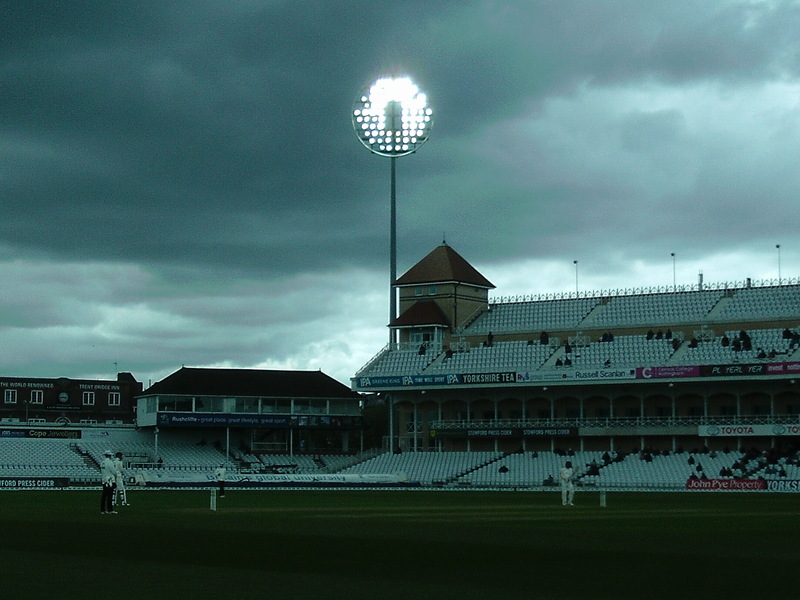 The Trent Bridge match vindicates one of the arguments of those who favour a Two Division Championship. There were no easy, devalued, runs against two attacks with four near Test-quality seamers (Willey, Brooks, Patterson and Plunkett on the one side ; Ball, Broad, Gurney and Bird on the other). 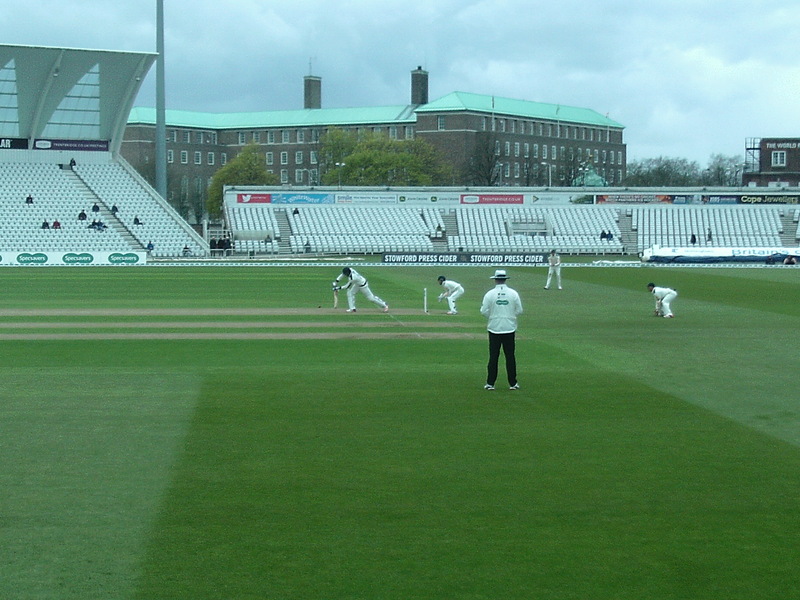 The drawback is that the concentration of the top bowlers in the First Division (Brooks and Willey were lured from Northamptonshire, Broad and Gurney from Leicestershire) threatens to leave the Second Division as an environment stripped of its apex predators, in which some fairly unfit-to-survive batsmen can graze and thrive. Wednesday at Wantage Road was, I suppose, in the wider scheme of things, a nothing match between two nothing-in-particular teams. Derbyshire have been de-fanged by the loss of Footitt to Surrey (their opening bowlers were those old partners-in-crime Fletcher and Carter, last seen at Radlett https://newcrimsonrambler.wordpress.com/2015/09/27/304/) . Northants’ bowling, with Ollie Stone sidelined, might as well have left its dentures in a glass at the side of the bed. The first three days had seen a glut of runs, elongated by rain, and the chances of a result were slim or none when I arrived, but so too – oh the relief! – were the chances of bad weather. I settled down, high in the new stands on the Eastern side, far from the action but catching most of the warmth and light, to bask like a sand lizard, secure in the knowledge that the players wouldn’t be allowed to come off the pitch until 5.00. Shortly before tea, when both openers (Chesney Hughes and Billy Godleman) were making stately progress towards their centuries, all Hell broke loose (or as much Hell as about a hundred elderly people can raise). I hadn’t caught what had happened (I may have been absorbed in my book, I might have dozed off), so I asked my nearest neighbours (about ten yards away) what all the fuss was about, but they hadn’t seen it either. Eventually it transpired that Jake Libby (on loan from Nottinghamshire) had claimed a catch on the boundary, but the batsman (Godleman) was doubting his word and refusing to go. In a televised match the incident would have replayed and analysed endlessly and inconclusively, in an Ashes Test it would have led to a week-long Twitter war between pro- and anti- Spirit of Cricket factions. As there were no cameras here, and the Umpires seemed to feel unqualified to make a decision without their assistance, it led to a ten minute argument out in the middle, to the accompaniment of slow handclapping and cries of “disgraceful” from those in the crowd who had been nearer to the incident than they had. In the event, the Spirit of Cricket was to have her revenge on Godleman. On 94, with time running out, he looked to reach his 100 by aiming a majestic heave at one of the aggrieved Libby’s strictly occasional off-spinners, but succeeded only in wrecking his own wicket. He returned to the pavilion to the accompaniment of what the official web site politely described as “catcalls“. At ten to five, as I was making my way to the exit, the final sign that the Muse of Comedy had taken over came with the solemn announcement that Josh Cobb would be taking over the gloves from Ben Duckett*. Duckett would be bowling. Chesney Hughes (who had already reached his hundred) prodded forward respectfully to his second delivery, the ball spiralled gently into the lap of first slip, who juggled and dropped it like an electric eel, at which point they shook hands (grudgingly) and called it a day. “Proper cricket” be damned. I haven’t had so much fun in ages.